You’ve probably heard on the news that you can currently see all five naked-eye planets together in the sky. Those are (from east to west): Mercury, Venus, Saturn, Mars, Jupiter. Click on the chart above to open a larger version in a new tab. You’ll note that Pluto is also in the mix, though you won’t be able to see it without a powerful telescope. Mercury will also be tough to spot unless you have clear skies and an open view of the southeastern horizon. But you’ll have to get up before sunrise to see this grand display. If you want a printed version of this chart to take outside with you, just right-click and save the large version. You don’t really need the colors, so if you have a capable graphics editing app I’d recommend converting it to grayscale and inverting it (swapping light tones for dark and vice versa) before printing. It’s a 100 dpi graphic, so it should be easily readable if you print it to fill a standard 8½x11 sheet of paper. The chart above is “curved” like the view through a fisheye lens because I set my digital planetarium, Cartes du Ciel, to display a 180° FOV (field of view). This was needed to capture all the planets in a single chart, spanning azimuth 80° through 260°. The “horizontal” lines mark elevations (above the horizon) in 15° increments. 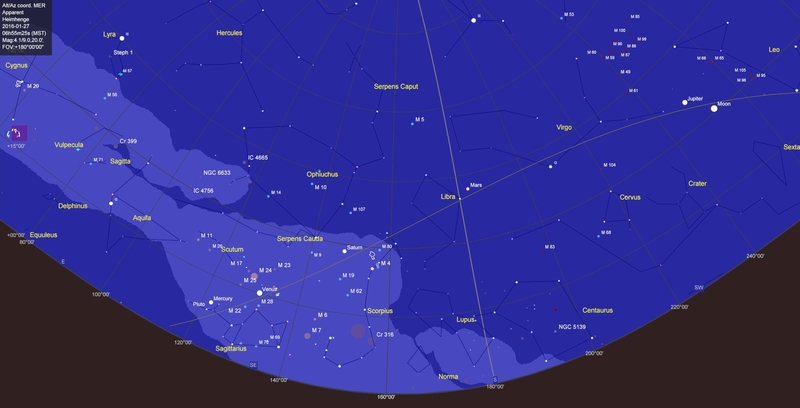 Mars will be the highest up, with an elevation near 45°. Mercury will be the lowest at around 10°. Those elevations are as seen from Arizona’s latitude of 34° — your elevations may vary. You can see the entire display easily with your eyes (using peripheral vision), but if you want to photograph the display you’ll need a wide-angle lens. The distance between Mercury and Jupiter is around 112°, so any wide angle lens with a focal length < 14mm would work. That’s considered to be an ultra-wide-angle lens, capable of ≈115° FOV. The next step up would be a fisheye lens, which captures a 180° (or >) FOV. Either lens is an expensive accessory, but they come in handy for displays like this. Starting on January 27th, the waning gibbous Moon will join the five planets. The sky chart shows the Moon near Jupiter on that date, but over the next few days you’ll see the Moon drift steadily to the east and pass close to each of those planets in sequence. On average, the Moon drifts about 12° farther east each day with respect to the stars. Of course, the planets also move with respect to the stars, but more slowly than the Moon. That means you’ll be able to see this “grand alignment” for about a week. So get up early and check it out. Alignments like this happen every once in a while, but they are rare enough to make it worth getting out of bed.